The only issue left with the fullscreen functionality is proper workbench integration and that is being tracked with this bug. 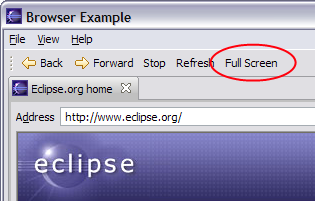 I’m sure the Platform UI team would love help with the bug if you have some cycles to spare for the upcoming Eclipse BugDay. ← Previous PostGEF moving to J2SE-1.5?